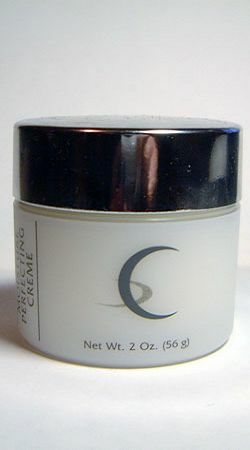 This Perfect Hydrating Creme has a lightweight, dual-moisturizing formula that actually “re-programs” your slightly dry and dehydrated skin to measurably retain more moisture for immediate, long-lasting comfort. 2 OZ costs $39. It really is a perfect moisturizer. It’s great for oily or combination skin since it’s so lightweight; and if you’re applying makeup afterwards it will glide on, and stay on – flawlessly. Her facials are the BEST in the business. She’s a cosmetologist – but I would (and I have) replaced every dermatologist I ever had in exchange for Christine’s services, i.e., facials, and now her products. She flaunts the longest list of celebrity clients I have ever seen – such as Hilary Swank, Penelope Cruz, Rachel Weisz, Mariska Hargitay, Kate Moss, Gisele Bundchen, Helena Christensen, Kimora Lee Simons, Carmen Kass, and – if you can believe it -even more! Christine is located in New York City (the lower east side – Orchard bw Grand and Broome) so unfortunately if you live outside the NY area she won’t be unclogging your pores anytime soon. And even if you’re in the city – the outrageous prices she charges ($250 per facial plus $250 per microdermabrasion – although well worth it – and she has packag plans for savings) and her months in advance overbooked schedule might stop you from making an appointment with her. Here’s the good news:she recently launched her own product line, named after herself, so everyone can benefit from her skin expertise. There is a wide range for all skin types, and it’s priced fairly- compared to her in-office service costs and in comparison with other Sephora-worthy products). I have exchanged every single fancy, brand name, high end, designer product I used to use – from Lancome to DDF to Murad to Chanel to La Mer to La Prairie, and so on – in exchange for a mirror vanity filled with Christine Chin! Why, you ask? Because THEY WORK!!! Christine even says that the combination of the Daily Renewal Refinishing Serum and the Retinol Smoothing Fluid, when used daily, has a similar effect on your skin as her micro treatments. Try it! It works for me – I’ve never had more clear, radiant skin than since I’ve started using her products. These are just some of my favorite products for my skin type (I have oily/combination skin that’s acne prone) – but she carries products for all skin types so click here to check out her website for her full product line. The clearest way to judge is by looking at her client roster above! Check it out – and tell me what you think!